GuideDogs.org is sporting a new home page. You now have access to personal fundraising pages, a virtual tour of our campus, the school's very own Facebook page, and a new blog on twitter. 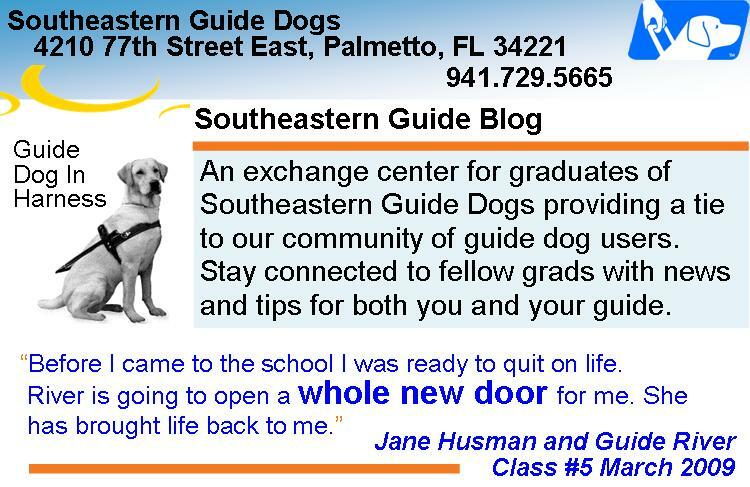 Once there, Southeastern Guide Dogs will come up as the page title. There are buttons/boxes reading from left to right that tell you how to get around the page. Scroll down to hear what our friends have to say about our dogs. Look for news soon about improvements being made to this blog. As always, we welcome any suggestions or comments you may have especially related to the changes. Please be patient with our renovations. At times you may experience outages when our network is down.